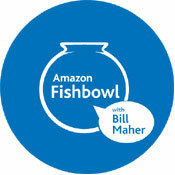 We are not the most technologically savvy of AdFreakers, so forgive us if you’re not too impressed by the following: We sampled the Amazon Fishbowl with Bill Maher, delivered by UPS on Amazon.com, today. And we love the way it works. By clicking on the “show playlist” button at the bottom of the little TV screen, you can watch different segments of the show in any order—and not watch what you’re not interested in. The latest episode (the second in this new series) went up June 8. It’s a new and wonderful way for our DVR-deprived self to consume programming. And kudos to UPS for embedding its message via Thomas Friedman, who talks about his new book, The World Is Flat.